At our firm, we spend a lot of time talking to business leaders about the intangible assets they have at their companies – people, reputation, intellectual property and customer loyalty, to name a few. When these assets are in good working order and being properly utilized, they are the primary drivers of revenue, innovation, competitive advantage and ultimately, company value. This is especially true when it comes to human capital. People really are companies’ most important assets. In today’s knowledge-based economy, most companies compete primarily based on their employees’ productivity and ingenuity. This isn’t only true for service and technology companies. As software continues to take over every aspect of business, nearly all companies will live and die by their ability to innovate. The vast majority of business leaders would completely agree with this. They know how important people are to the success of their companies. In fact, organizations with highly-engaged employees achieve twice the annual net income and deliver 30% higher sales than organizations whose employees lag behind on culture. But despite the fact that most organizations know that their long-term competitive advantage lies with their people, the majority of companies don’t devote enough time and effort to improving employee retention. And let’s face it, employee turnover is very expensive. And its financial impact on organizations isn’t something that might happen. It does happen and it always leaves an immediate and a long-lasting mark. According to Gallup, turnover among millennials costs the U.S. economy $30.5 billion annually. Additionally, Deloitte believes the cost of losing an employee can range from tens of thousands of dollars to 1.5–2.0x the employee’s annual salary. So, if you do the math, losing that $75K per annum employee might actually cost a company $150K in the long run. These costs don’t even include those associated with the loss of overall employee engagement and the negative culture impact as remaining employees wonder why the person decided to leave. Business owners and managers need to fully embrace the fact that employees are appreciating assets that produce more and more value to the organization over time. 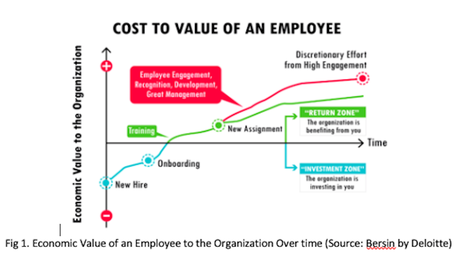 So we know employee turnover is expensive, but what can be done to improve retention? Employers can start by offering competitive pay and benefits. People want to be well-compensated. And that includes competitive benefits that your employees want. Aside from compensation, there are other inexpensive methods to convince employees to stick around. Hire the right people: Retention starts with hiring the right employees, ones who are behavioral and cultural fits for the job. An outstanding candidate that doesn’t match the behaviors and culture of your business won’t stay around long. They’ll take their skills somewhere where they fit in. Provide encouragement and recognition: When employees truly do something worthy of praise, give it. The goal here is to create an encouraging, positive work environment. When employees feel respected, acknowledged, valued and motivated, they are more likely to stay. Show your employees a clear career path: Most employees want to increase their skills and knowledge and move up the career ladder. Employers need to show employees a predictable career path, complete with coaching and training, to give them a sense of direction and purpose. Allow flexible work schedules: If it’s possible, allow flexible work schedules. Flexible schedules let employees adjust their work time and location and create a work-life balance for themselves. There are always going to be employees who want to leave the company. They might find other opportunities, decide to change career paths, or maybe start their own business. While employee turnover can’t be completely eliminated, employers can reduce it by providing a workplace where employees want to stay. Athan Demakos is President & Chief Strategy Officer of Saltare Solutions. His specialty is helping organizations harness the value of their intangible assets to drive growth and build sustainable competitive advantage. Saltare Solutions, LLC drives business growth by enhancing the value of a company's intangible assets. With up to 85% of today’s business value derived from intangible assets, Saltare helps business leaders recognize, capture, and communicate these assets to understand the true value of their companies.